SUVA Fiji, Dec 6 2017 (IPS) - Continuing his “America First” approach, President Donald Trump has pulled the U.S. out of a proposed United Nations global compact seeking an agreement to protect the safety and rights of migrants and refugees. at a global conference, with more than 700 participants from 109 countries, discussing topics ranging from human rights to global warming. The weeklong conference is scheduled to conclude December 8. “Whole communities and countries are already being displaced because of changing weather patterns, rising sea levels and more frequent and catastrophic events. But the response at the moment is very ad hoc,” declared Danny Sriskandarajah, CEO of CIVICUS and organiser of the event in Suva. 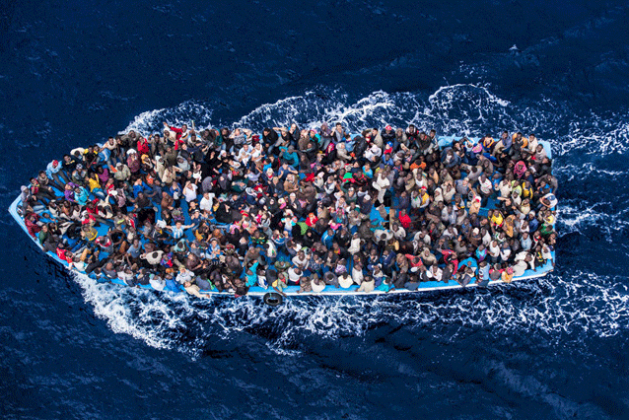 The United Nations has an ambitious plan to create a more humane global strategy on migration. But the Trump administration has pulled out, saying involvement in the process interferes with American sovereignty and runs counter to US immigration policies. President Trump viewed the proposed pact as a threat to national security. Trump’s decision was disclosed last Saturday by Nikki Haley, the U.S. ambassador to the U.N. “Our decisions on immigration policies must always be made by Americans and Americans alone. We will decide how best to control our borders and who will be allowed to enter our country,” Haley said in a statement. “The fact that the US is pulling out is really worrying. Human mobility has happened throughout history. It is going to increase. So we need sensible collaborative ways of managing that mobility,” the CEO of CIVICUS said at the University of the South Pacific in Suva, where ICSW meetings are taking place. Under Trump, the U.S. has taken a hard line on immigration. The president wants to build a border wall between the U.S. and Mexico, arrest illegal immigrants and slow down legal immigration. The U.S. has also withdrawn from many global commitments, including the Paris Climate Change agreement. The ‘Global Compact on safe, orderly and regular migration’ is expected to go before the UN General Assembly for approval in September 2018. And ICSW wanted to highlight the importance of this issue. Instead, many activists at ICSW now express their concerns about its potential demise. Meanwhile, conservative websites that support president Trump reported the news with triumphant headlines. “U.S. Withdraws From Obama-Negotiated U.N. Agreement on Mass Migration,” claimed Redstate.com boldly. Asked about the US withdrawal, UN spokesman Stephane Dujarric told reporters at a news briefing on December 4: “Obviously, it’s a decision that we regret, but I think there’s still plenty of time for US engagement on this issue. But the decision should not disrupt what we see as a clear, unanimous outcome of the New York Declaration for such a Global Compact, which, I should remind you, will be non legally binding and grounded in international cooperation and respectful of national interests”. “From where we stand, the positive story of migration is clear. It needs to be better told,” Dujarric noted. Equally, he pointed out, the challenges it faces need to be tackled with more determination and greater international cooperation. “We obviously look forward to the outcome of the discussions of… in Mexico and the start of the more formal discussions in February,” he added. Meanwhile, in Puerto Vallarta, Mexico, the Preparatory Meeting for the Global Compact on Migration got underway. At the opening of the Conference, the Special Representative for International Migration, Louise Arbour, stressed that migration demands a global response. She added that the success of the global compact will rest on maximum countries’ political and moral buy in and willingness to enhance cooperation at the regional and international levels.